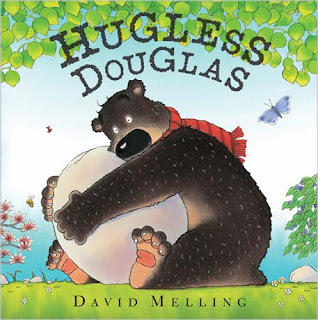 We've all been getting very excited about Hugless Douglas, the new book by local children's author David Melling, and we wanted to do a really special event when it was launched. So we hatched a rather groovy event for children in the courtyard garden, featuring David, some rather spiffing bear paws, a large cardboard cut-out - and plenty of pens, pencils, brown material...and glue! We ran two sessions in the afternoon last Saturday, and David started each with a storytime, reading aloud the story of the bear who wakes after a long sleep, and really needs a hug... David then gave us a drawing masterclass, teaching everyone how to draw Douglas, and tips for any budding future illustrators: Here are some of the bears that resulted: (That last one looks a bit suspect - drawn with the help of someone a bit older than out target audience methinks). And then came the messy bit. We had - at great effort, and not a little trial and error - created a series of card templates, with velcro (to allow us to do the whole thing twice) that completely covered a large template of Hugless - complete with head and arm holes. The kids had been asked to bring along brown material in a special bag, and we got to work cutting, ripping, sticking and glueing... and then taking each section and building our own bear... And finally, everyone got a chance to put on the Hugless scarf, some fabulous big Hugless Douglas gloves courtesy of Ali, and stick their head and arms through to give us their biggest, smiliest bear impressions. Rrrarggh! We are so proud to be the U.S. publisher of Hugless Douglas. David Melling will be joining us this year at BookExpo America for an autographing session. And autographed copies of his book will be available for sale at Toys R Us stores throughout the country this summer. Your Hugless Douglas event sounded wonderful! Thanks for sharing.